When I was demonstrating at the Lie-Nielsen Hand Tool Event earlier this month, talking to a number of people, I realized there's a whole class of potential woodworkers out there who are missing out due to some combination of severely limited space, funds, or skills. The prototypical example was the lady who was a grad student living in a tiny city apartment with her husband and knew nothing about hand tools. What they have is the interest and the desire. I know where they're coming from. I spent time in that situation myself, three out of three. If you're one of those people, this is for you. Some of my woodworking buddies tell me they enjoy doing some work with hand tools, but I take it to extremes. I tell them that's because I want to show people it can be done. You don't have to have a big workshop with a bunch of big, noisy, expensive power tools. You can work in a tiny footprint with a modest number of small, quiet, inexpensive hand tools. And then fold it up out of the way when you're done. The apartment workbench is an adaptation of the portable workbench that appears in Roy Underhill's The Woodwright's Apprentice and earlier in Bernard E. Jones' The Practical Woodworker from 1918. 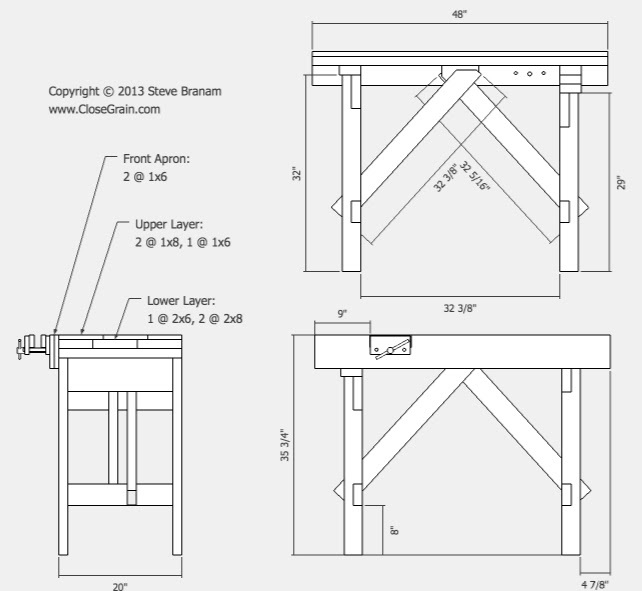 From Paul Sellers' workbench, I've borrowed the idea of using pre-dimensioned construction-grade lumber. The top is laminated from these materials, offsetting the widths in the two layers. It's small, with folding legs, to address the space limitation. It's made from a small amount of inexpensive materials with a small number of tools, to address the funds limitation. 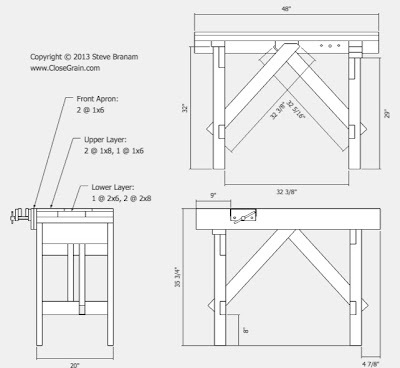 It's design is simple, relying on pre-dimensioned lumber, to address the skills limitation. Yet it's practical and functional, allowing you to build those skills. Make no mistake, this is a small, crude, light bench. It's always better to have more mass. But that conflicts with the limitations we're dealing with. So it's a compromise, and your work will have to adapt to that. I chose to get everything for the bench from a home center, because those are the most accessible suppliers for people, widely available and offering the lowest prices (though that's both good and bad). I limited myself to what you'll be able to find there. Better quality materials and items are available from more specialized suppliers, but the goal here is absolute simplicity for the beginner while still maintaining a sufficient level of quality. I generally have a low opinion of the hand tools available at home centers. Before World War II, people built everything with hand tools, and a tradesman or craftsman could expect his tools to last through tens of thousands of hours of use, to be passed from generation to generation. That broad market for hand tools simply no longer exists. Because of that, the tools at home centers now have been reduced in quality of materials, design, and workmanship so that their working life is a few hundred hours at best. They're made to be thrown away after short use. That makes them cheap to buy, but means they're also cheap in quality. However, for the hobbyist who only gets a few hours a week to use them, some are good enough to start with. Not all; some fall below the threshold of acceptability. I'll cover tools more below. In the US, the predominant home center retailers are Home Depot and Lowe's. They sell lumber in standardized, pre-dimensioned sizes. I assume there are similar retailers and standardized lumber in other countries, though not all. I went to Home Depot for all the materials and tools used to build the bench. I ordered the small vise from their website. The 4 1/2"x6 1/2" Pony vise is also available from Amazon, as well as other vendors. 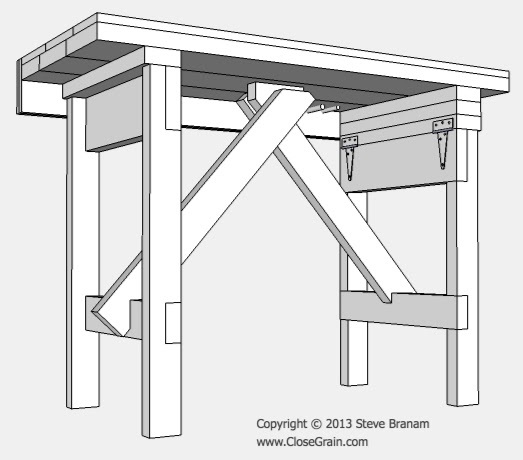 The bench can handle a slightly larger vise (available from other websites) if you're willing to spend more money, but be careful about getting one too large that overbalances it. Vises get heavy fast. You can hurt yourself extending a heavy vise that tips the bench over on you. Portability, light weight, and convenience take priority here. That's part of the compromise. You can click on any of theses images for a larger view. To obtain the plans, your browser should allow you save the images to your computer so you can print them out (you may have to right-click or Control-click on an image for a popup menu with download options). 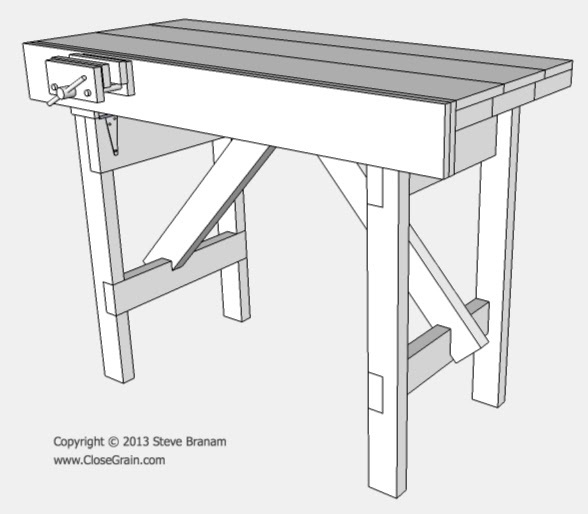 The height of the bench as shown is 35 3/4". For comparison, my kitchen counter is 36" tall. I'm 5' 8", so that puts the bench about an inch below my belt. Height is a personal preference. The older you are, the more your back will appreciate erring on the side of higher, to reduce bending over. If you want to make yours taller, you'll need to mount the spacer blocks wider apart on the underside of the top so that the legs fold down inside them. You'll also need to make the angled braces a little longer. It's best to save cutting the braces to size for the very last, since you need to size them to whatever you actually end up with. Rear underside, showing how leg assemblies are attached to the top. The cross-braces provide rigidity. Like bridge trusses, they form triangles that can't be deformed. Rear view disassembling the braces and folding the bench. Then you can stand it up on its side or end for storage. Or use it as a low coffee table; folded up, it's 9 3/4" high, about shin height. The bench is built completely from construction-grade 2-by lumber (US standard sizes 2"x4", 2"x6", and 2"x8", sold in 8' lengths), and No. 2 premium pine 1-by lumber (US standard sizes 1"x6" and 1"x8", sold in 8' and 6' lengths). All you need to do is cut it down, cut some simple lap joints in it, then glue and screw it together. There's one slightly challenging cut, but you'll get the hang of it quickly. This should be within the abilities of even complete beginners. Building the bench will start building your skills. The nominal dimensions used to identify lumber are actually the rough-milled sizes, before planing and jointing at the lumberyard. The final, surfaced dimensions are smaller: 1 1/2" thick for 2-by lumber, 3/4" thick for 1-by lumber; then 3 1/2" wide for 4" lumber, 5 1/2" wide for 6" lumber, and 7 1/4" wide for 8" lumber. I've sized all the parts based on these standardized dimensions. 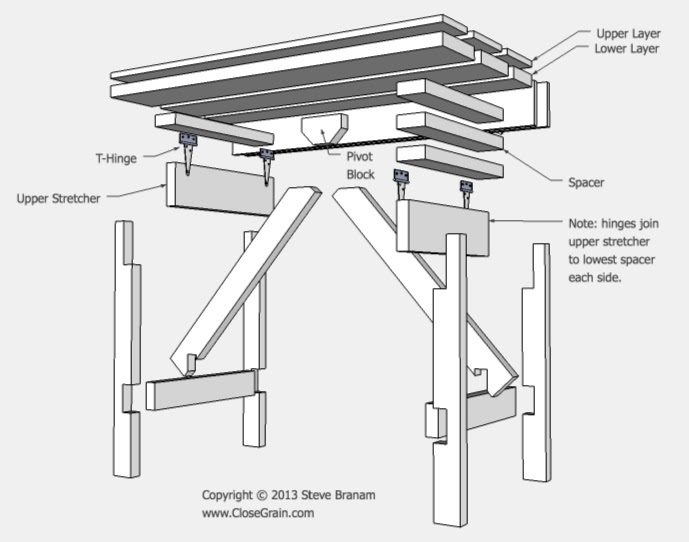 If you're using lumber following a different sizing system, you'll need to adapt the design slightly. But it's all based on the widths and thicknesses of the standard units. Fit the pieces to what you have. The 2-by lumber is generally labeled "KD SPF", "KD whitewood", "KD fir", etc. KD means kiln-dried. SPF means any spruce/pine/fir. This is what's used for floor and ceiling joists and framing studs in construction. Since it will be covered by siding and sheetrock, it doesn't have to be pretty. The corners of this stock are rounded, so butting pieces edge-to-edge leaves a small groove at the joint. The 1-by No. 2 premium pine is pine with a certain number of knots. It's used for finish carpentry. The corners of this stock are left square, so butting pieces edge-to-edge leaves a smooth joint, which is why I used it for the benchtop upper layer. There's also "Select" pine, which is almost entirely free of knots, but roughly twice as expensive, used for a higher grade of finish carpentry. A few knots in the bench are an acceptable tradeoff for reduced cost. When selecting lumber, go through the stacks and bins and examine each piece. Some of the 2-by lumber looks like it's been run through a chipper, so skip those. The other main defects for both 2-by and 1-by lumber are various types of warping, cracks, and splits. Sight down the length of each piece and turn it to all sides to confirm that it's straight end to end and free of cracks or splits. Pick the best pieces. Restack any you're not keeping. All the materials and hardware needed for the bench except the vise, which is currently being shipped (this shows one extra 2x4). Each layer of the top consists of one 6"-wide piece and two 8"-wide pieces. Since the bench is 4' long, you only need to buy one 8' board of the wide stock in each thickness, which you'll cut in half to get the two pieces. For the narrower stock, the remaining half of the 8' 2x6 will be used for the upper stretchers on the leg assemblies. You only need to buy a 6' length of 1x6, which will leave a 2' scrap. You can use this for the vise chops (the wooden liners for the vise). Total cost of materials: $119.36. Addendum: while working on assembly, I realized I needed two additional packages of screws: #10x1 1/2, 25 and #12x2 1/2, 20. These should be under $10. Also, it doesn't hurt to have extras in all the sizes, because the regular wood screws at Home Depot are such low quality that the heads strip out easily when driven by a drill. Then you're left with a half-driven screw that you may need to remove with vise-grips. You might have better luck with decking screws. In selecting the tools to build the bench, I opted for the lowest price tool that offered a sufficient level of quality. That means I skipped a few of the very cheapest items and spent a little more money for a better version. That's a long-term tradeoff. You can certainly save a little more initially by going strictly for the cheapest, but you'll end up spending additional money pretty quickly to replace them with something better. So start off better and save yourself the trouble and expense. Beware cheap, junky tools, no matter how shiny or how big the word PROFESSIONAL is on the package. Because this bench uses pre-dimensioned lumber, you don't need any hand planes to build it. 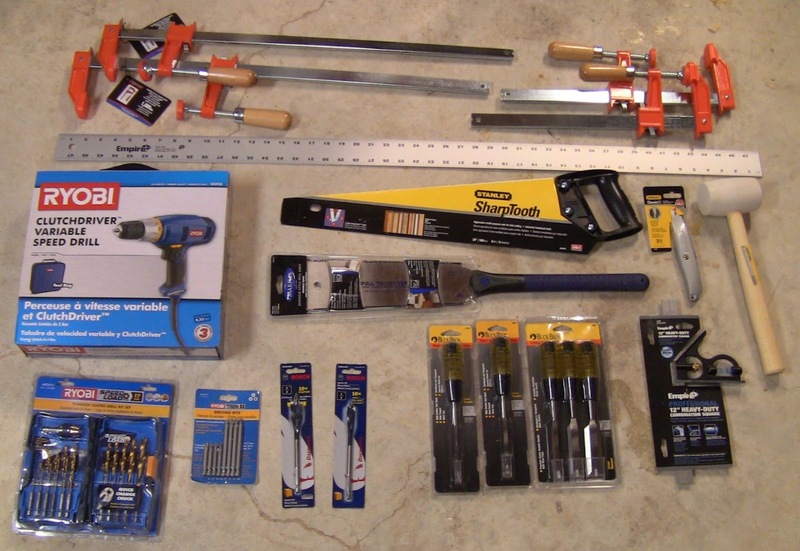 You need measuring and marking tools, a saw, a chisel and mallet, and a few clamps. You also need a drill for drilling screw holes and driving screws. While I emphasize hand tools, Home Depot doesn't carry hand-powered drills, so I got a power drill. I chose corded instead of cordless because that offers better power for the same price. That means it can handle drilling larger holes with spade bits, and you don't have to worry about the battery dying halfway through driving a bunch of screws. Note that I bought 100 screws! Tools: clamps, straight edge, power drill, handsaws, utility knife, mallet, drill bits, driver bits, spade bits, chisels, and combination square. The clamps shown are the bare minimum you'll need. You can never have too many! These are Jorgensen Heavy-Duty bar clamps. They also have light duty bar clamps for a few dollars less, but these are much sturdier. I got two saws. The 20" Stanley SharpTooth saw is a western-style push saw. It has impulse-hardened teeth sharpened in a combination rip/crosscut pattern. These teeth can't be resharpened, and the handle is pretty ugly, but it does a sufficient job until you can find a nice old antique saw to restore. The Irwin/Marples Japanese pull saw (known as a ryoba) is an extra. It has a crosscut side and a rip side. You can get by with either one of these saws. For chisels, I got a Buck Brothers three-pack with 1/2", 3/4", and 1" chisels, and added separate 1/4" and 3/8" chisels (not needed to build the bench but good to have). There are cheaper ones, but I find these a little better. I got a reasonable selection of drill and driver bits with quick-change adapter. This really is a helpful gadget, especially when driving screws, where you need to switch back and forth between counterbore, pilot, and driver bits. The spade bits are for larger holes. This is enough tools to bootstrap you from nothing. If you already have some tools, by all means put them to use if they're functional. While you don't need any planes to build the bench, they'll be the next thing you should get. I don't recommend the really cheap bench planes that Home Depot carries in the stores. However, online they carry Stanley planes that are reasonable, 14" No. 5 jack plane (model 12-905, $61) and 9 3/4" No. 4 smoothing plane (model 12-904, $50). These are the lowest price planes I would recommend. The Stanley No. 5 and Stanley No. 4 are also available from Amazon at similar prices, as well as other vendors (however, check prices carefully, some sell them for twice the price). If you buy old handplanes online, you can certainly find better quality ones for the same or less money. The trick with these is that you'll need to spend some time cleaning and tuning them. Also, not all online sellers know their tools. So they may not be able to accurately assess condition or know if parts are missing. My favorite reliable online tool dealer is Patrick Leach. 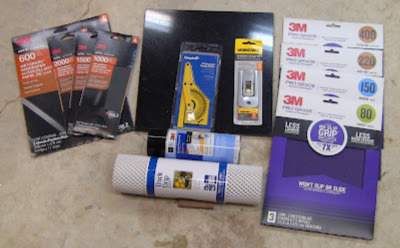 He knows his tools (Patrick's Blood and Gore is a widely-known encyclopedic collection of old Stanley tool information), and always has good affordable ones on his monthly tool list. Chisels and handplanes need to be sharpened. No matter how sharp they are initially, they dull in use. If you're going to use hand tools, you need to be able to sharpen them. The tools Home Depot sells have been sharpened at the factory on sanding discs or belts, leaving fairly heavy machine marks. The simplest, least expensive sharpening setup to get started uses sandpaper adhered to a hard, flat surface, going through a series of progressively finer grits. Once honed this way, even cheap tools can take a good edge. Over time, the cost of sandpaper does add up, so you may opt for other methods long term. Sharpening: wet-dry automative sandpapers in extra fine grits, polished granite floor tile (you can buy these singly), protractor for measuring bevel angle, single-edge razor scraper for removing sandpaper from the tile, spray adhesive, roll of non-slip shelf-liner, and coarser sandpapers. I'll go through the sharpening process later. For now, the factory edge on the new chisels should get you through the bench. The power drill and bits, extra saw, and extra chisels added $113 to the total. You need to have some way of drilling and driving, so you could get a cheaper drill and fewer bits for less than I paid for the drill. The other items are nice to have (especially the small 1/4" chisel), but you could work without them for a while. If you plan on restoring old hand planes, get a second granite floor tile to use for cleaning and flattening beds and sides on sandpaper. Polished marble tiles also work. When buying sandpaper, you don't have to match the grits I've shown here exactly; if you skip an intermediate grit or get one slightly higher or lower, it will still work. I got the automotive wet/dry sandpaper in the finishing section of an auto-parts store. Total cost of tools: $291.06. The total price to build the bench and have the tools left over to build stuff is $410.42. Add the two handplanes, and the total price to create a functional workshop, starting from nothing, is $521 plus tax and shipping. You can shave about $50 off that by skipping the extra items I got. If you want to learn more about acquiring hand tools, see Chapter 4: The Tools in my online course, Intro Hand Tools. In part 2, we'll start building the workbench, beginning our first cuts and addressing the bootstrap problem: how do you build something when you don't have a workbench to work on? Hint: that's a nice stack of lumber... I'll show you how to use all the tools. Before you cut anything, double check the measurements of the materials you have and any adjustments you've made. Plans can also have mistakes. Make sure everything adds up properly. Otherwise you may have to spend more money on replacement materials. A great design and should motivate those who want to get started in woodworking. Doesn't cost an arm and a leg, and wasn't even built by some obscure Frenchman! Good job. Thanks! Built by some obscure New Englander! great post on an apartment bench. This could also be used as a traveling bench to help out the in-laws. I don't need one but I would like to make one just to do it. 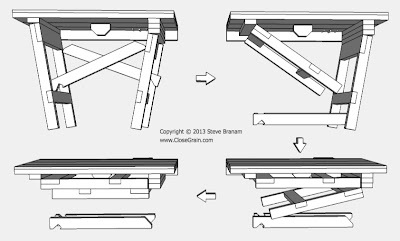 One question - the plans state 2 -2x8's and 1 2x6 for the bottom layer and the same dimensions for the top with 3/4 stock. The cost sheets only list 1 2x8 and 1 1x8. 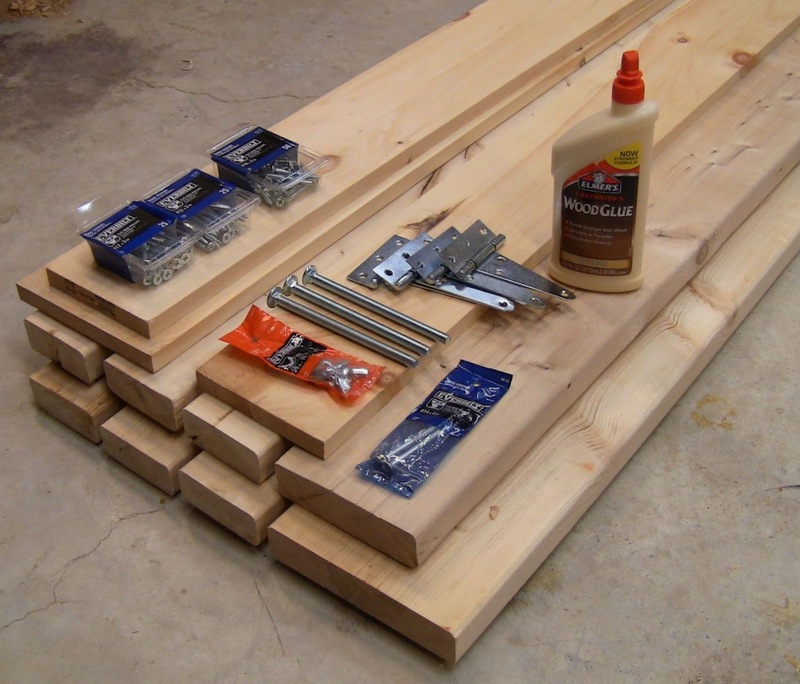 The bench is 4' long, so you only need to buy one 8' 2x8 and 1x8 and cut them in half. I've updated the post to indicate that. I didn't think that far ahead and I'm easily confused. Great article. Really looking forward to the next one. One note, the Amazon link to the Pony vice actually goes to the Stanely plane. Did you do all the graphics using Sketchup? Thanks, Seth! I've corrected the link. Yes, those are all SketchUp drawings. This is my second project using it. I'm really looking forward to this project, as it fits me to the T (except that I'm not female). Your tool selection is very well thought out, and the design looks very solid but simple to execute. Only one question--why not a plywood top? I'd imagine that stacking some precut panels would be more stable and easier to glue up. I have access to some Russian birch ply, and I was thinking of using that for the top instead of the wood. I was thinking of a sacrificial layer of MDF on the top. I'd love your thoughts. I build guitars mostly by hand tools, but I'm definitely only a hobbyist. Thanks! One of the great things about this hobby is that it's accessible to everyone, regardless of age or gender. All that matters is the drive to create. You could certainly make the top from plywood or MDF, building up layers of precut 4'x2' panels. I used solid wood because I really liked the way my Paul Sellers bench came out using those materials. I like the more traditional flavor. The main functional argument against sheet goods is their tendency to chip and delaminate under edge stresses. Specifically, I want the top to be able to take round holdfasts (like the Gramercy Tools holdfast), one of my favorite work-holding implements. Because a holdfast is driven down into a dog hole for a jam fit, the top edge of the hole takes a beating. Plywood and MDF will get torn up over time due to this. Not immediately, and you could screw down a replacement layer when it gets too bad. You also need to be careful about edge screwing into these materials. The front apron of the bench would have a weaker attachment and might eventually tear out. You could back it up with a long corner block under the front, screwed into the top from below, and through the apron from the front; just make sure it didn't block the legs folding up. So you could build a top from modern materials and build the undercarriage as shown. The plan is adaptable in a variety of ways to suit your specific needs. I'm going to build this as my first ever project. I would like to know if you will put some dog holes eventually ? If not, what would be the best way to hold things while working with planes ? Thanks a lot, this is a very great workbench build !! Hi Remi, thanks! Yes, I will definitely be putting dog holes in it. I'll cover that in part 5 or so. I highly recommend a pair of Gramercy Tools holdfasts from Tools For Working Wood. That's why I listed the 3/4" spade bit in the tools. 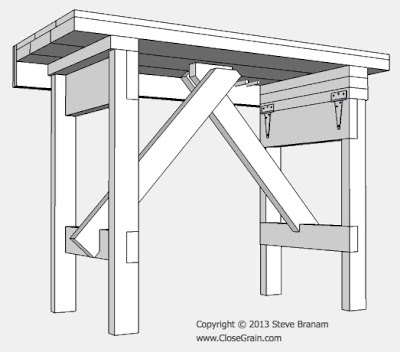 I like this idea, but it's a bit more complex than I am looking for and not as sturdy as I need. I need a solid foundation for a vice and ammunition reloading gear. It has to be solid. 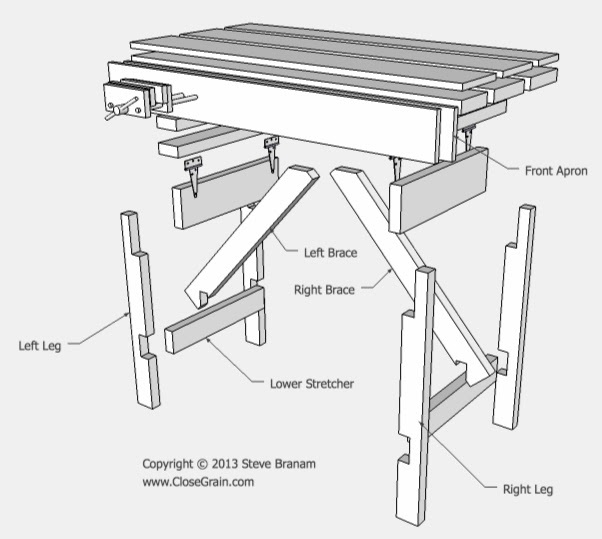 I have been playing with the idea of building a workbench surface that I can C-Clamp to my small dining room table (say 3x4'). 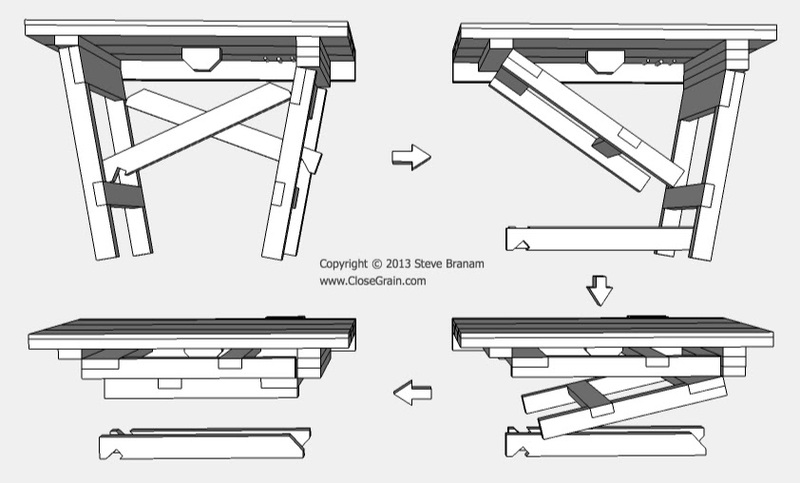 I'd like to split it long-wise to add hinges for folding and storing, and wonder if anyone has done this before.